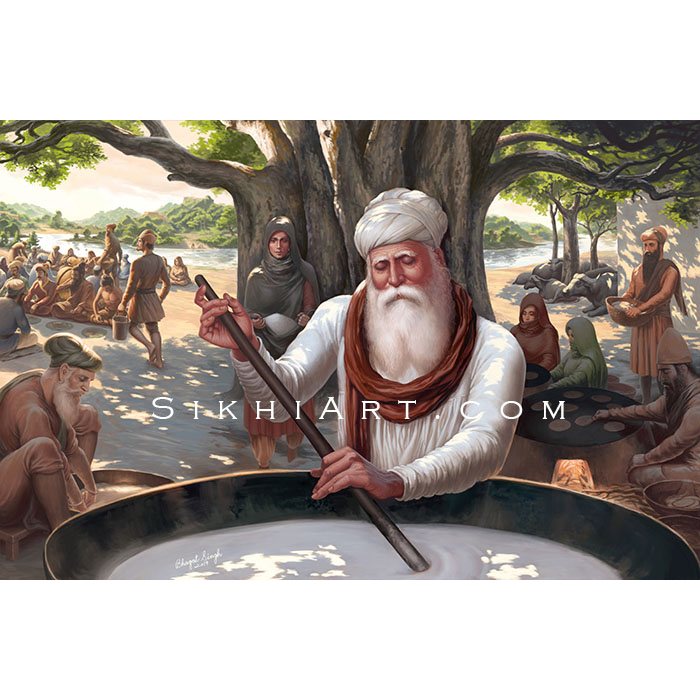 Guru Lehna ji (later Guru Angad Dev ji) demonstrated his devotion, dedication and divinity through Langar. 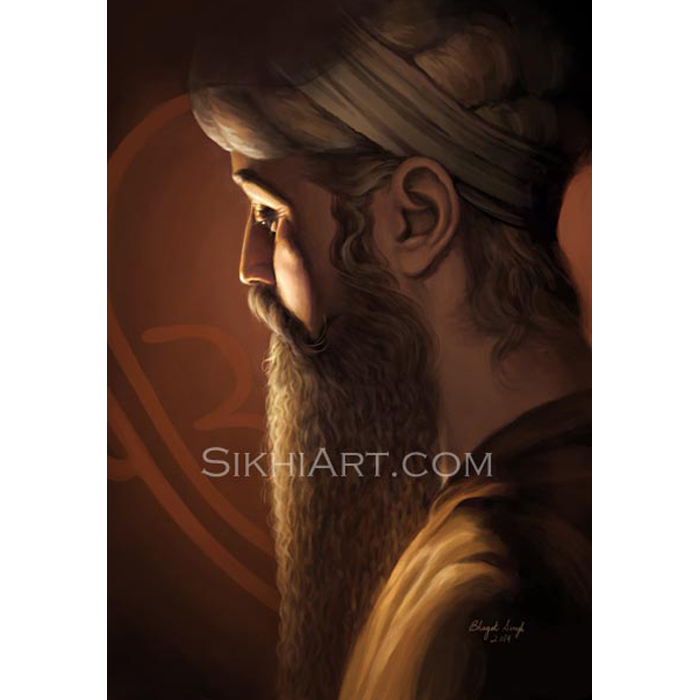 Prior to meeting Guru Nanak Dev ji, Lehna ji was a Guru himself and commanded a following of his own. Despite having such status, he became a mere Servant in Guru Nanak Dev ji’s kitchen. When no one would do the job, he was there in the thick of it, doing the grueling and messy work of collecting materials for Langar. 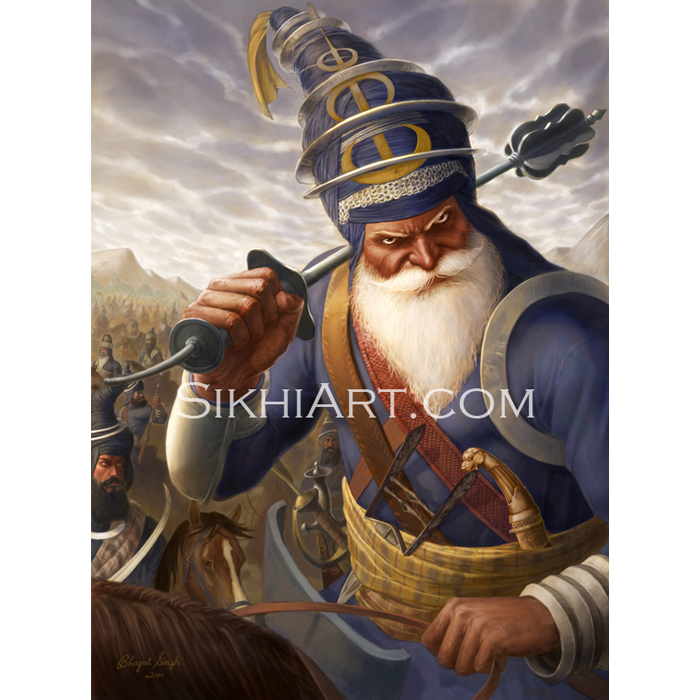 The former Guru became a servant and a part, angad, of Guru Nanak Dev ji, and thus, he was given leadership of Guru ji’s own following. Bhai Amar ji (also Bhai Amru ji, later Guru Amar Das ji or Guru Amar Dev ji) followed in the footsteps of Guru Angad Dev ji. He meditated on Ram, and performed Responsible Actions, and became a complete servant of the Guru. Guru Angad Dev ji became so impressed by Bhai Amru’s devotion, his dedication and the divinity shining from within him, that he made him the next Guru of the Sikhs. 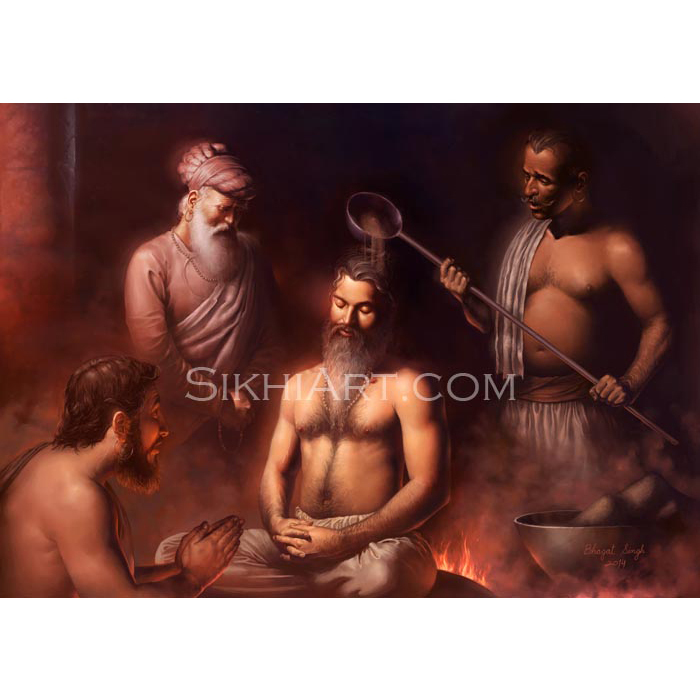 In the time period of this painting, Bhai Jetha ji (later Guru Ram Das ji) has not yet been given Guruship. In the painting, Jetha ji is seen standing in front of the Guru’s house. He collects the Chapatis from Bibi Bhani ji, his wife, the daughter of Guru Amar Das ji, who is cooking them on the hot plate. With your prints, you get colours as fresh and vibrant as Bhagat\'s original paintings. They are so highly detailed that you will discover new details in the print every time you look to admire it. They will not fade or decay so you get a piece that you can treasure your whole life. The finest and most desirable of Bhagat\'s prints is the Premium Gloss Canvas. Premium Canvases look like original oil paintings when combined with Bhagat\'s unique painting style and the painterly texture of the canvas. In addition to their rich colours, they capture the essence of what Bhagat paints. Be the first to review “Guru Amar Das ji – Langar Seva” Click here to cancel reply.